Open: 8:30 a.m.-5 p.m. Monday through Friday; 8 a.m.-4 p.m. Saturday and Sunday. 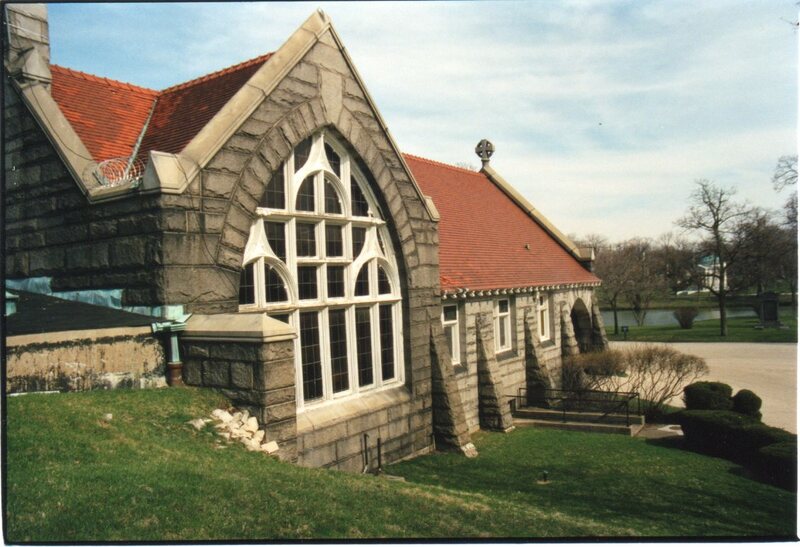 Note: On October 23, 2011 at 1:30 p.m., the Chicago Architecture Foundation leads a walking tour of Rosehill Cemetery. Ticket information is here. Established in February 1859, Rosehill Cemetery buried its first denizen that same month. Among its permanent occupants lie more than a dozen mayors of the City of Chicago, Civil War generals, and Charles Dawes, U.S. Vice-President under Calvin Coolidge. Others buried in Rosehill include Oscar Mayer, Aaron Montgomery Ward, Richard Warren Sears, the first publisher of Popular Mechanics, the inventor of the duplicating machine, the founder of Goodrich Tires, the creator of Schwinn bicycles, the originator of Cracker Jack, and the 14-year-old victim of Leopold and Loeb. A promotional booklet for Rosehill Cemetery Company, copyrighted 1913, reports that white roses grew in profusion in the area chosen to become a graveyard; hence, the name. Graveyards.com and other sources contradict this romantic little tale, stating the name came from a mapmaker’s error. The area had originally been called Roe’s Hill, after a nearby tavern-keeper (or maybe farmer — there are several variations). 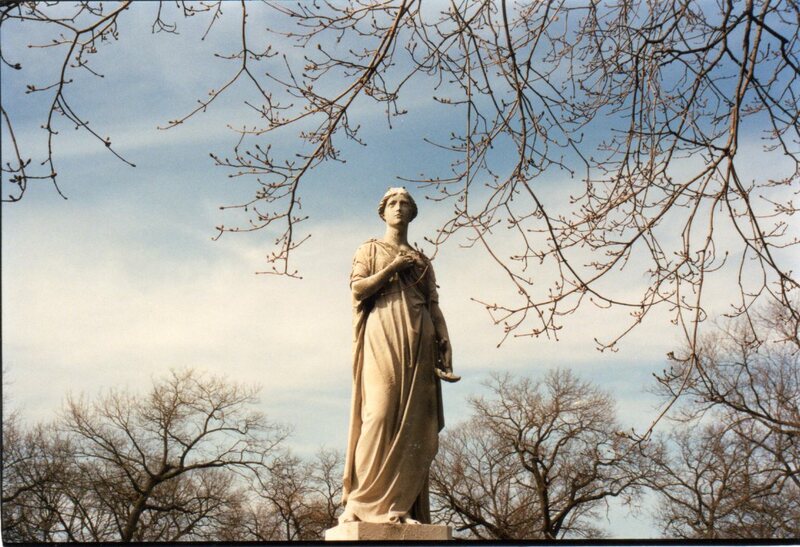 Weighing in at 350 acres, Rosehill remains the largest cemetery in Chicago. Rosehill’s “castellated Gothic” limestone gateway was designed by W. W. Boyington, architect of the Chicago Water Tower. At the turn of the last century, as many as 40,000 people a day strolled through that gate to picnic and enjoy the scenery. These days, Rosehill seems to be primarily a forest of obelisks, each competing with the next in size and height and epitaph. The tallest obelisk in Rosehill stands 70 feet high, commemorating Mayor “Long” John Wentworth, a friend of Abraham Lincoln who served as an honorary pallbearer for the president’s casket as it passed through Chicago on its way to Springfield. A smaller granite obelisk stands on the grave of George Buchanan Armstrong, who founded the railway mail service in the U.S. For the first time, a letter could be delivered across the country using dedicated mail cars, rather than being shipped through Panama or around South America. He died in 1871. The military plot contains the largest number of Union Civil War soldiers in the Midwest. Elsewhere in the graveyard, separate from the soldiers, stands the “Rock of Chickamauga,” a granite boulder hauled to Chicago from the battlefield in Georgia. It marks the grave of General George Henry Thomas, who held the field during the entire second day of the battle. The Volunteer Firefighters Monument was the first memorial erected to firemen in the U.S. A replica of it appeared in the movie Backdraft. Old-style firemen’s hats crown the four stone blocks around the original monument. The decorative fencing strung between them is made from old fire hoses. The base of the monument holds four relief panels: one shows four men carrying a ladder toward a multistory building from which smoke roils. It pays homage to the volunteers who died in the 1857 South Water Street Fire. Also in Rosehill stands the spectacular monument to Lulu Fellows. 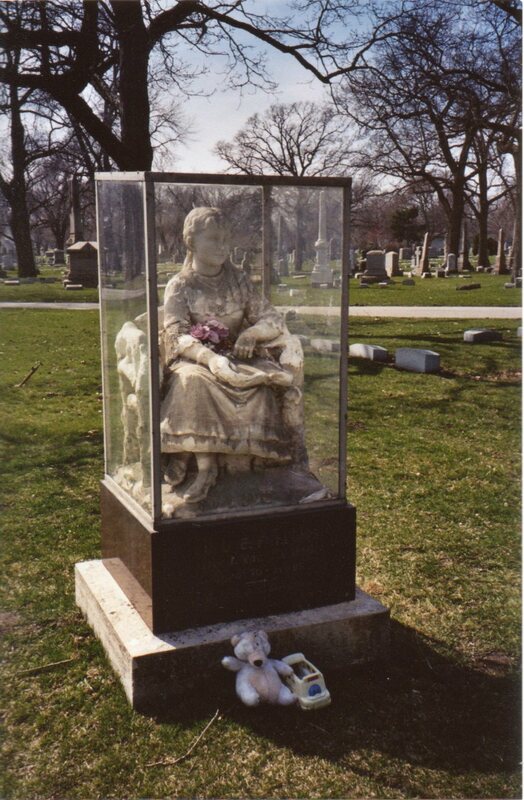 A marble statue of a little girl sits protected from the elements inside an aquarium of glass. Small round holes at the foot of the glass box allow condensation to escape. When I visited, callers had slipped dollar bills and silver coins and a small sprig of pink silk flowers inside. The epitaph declared, “Many hopes lie buried here.” Lulu had been sixteen when she died, but the child on her grave looked ten or twelve to me. Her hair hung in a gently curling sheet down her back. A stone locket dangled atop the lace of her bodice. She wore button boots, too. In the days before microwave machines were invented to heat through the frost layer, gravediggers took winters off rather than struggle with the rock-hard earth. Therefore, anyone who died in the winter would be transported to the graveyard, then stored in a “receiving” tomb until spring. The earthworks surrounding these communal tombs provided natural refrigeration, staving off decay. After the thaw, niches in receiving tombs would be relieved of their contents one at a time, as graves could be dug. Families held a second service — usually more private — when they finally consigned their departed to the grave. Many 19th-century graveyards still have buildings set back into the earth, where they once warehoused corpses. Old receiving tombs are often used as garden sheds now, housing lawnmowers and tree-trimming equipment. When I visited, the underground tomb adjacent to the May Chapel appeared utterly abandoned. The vault’s skylights were sharply pointed prisms of glass, held together by vergrised bronze. The first skylight had slipped from its mooring and listed down the slope. Despite the hazy sunlight glaring off the glass, I struggled to see inside. There were definite niches below, some sealed with white marble tablets, others open. This entry was posted in Cemetery of the Week and tagged Chicago cemetery, ghost story, Illinois cemetery, Rosehill Cemetery. Bookmark the permalink.